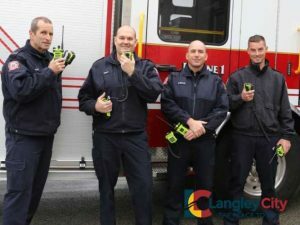 Langley City, British Columbia – Langley City Fire Rescue and Bylaw Enforcement have completed the transition to the new E-Comm 700 Mhz wide area radio network. The E-Comm operates the largest multi-agency public safety radio network in British Columbia. The radio system consists of seismically reinforced radio sites across Greater Vancouver and has portable trailers for emergency use. The system serves 19 municipalities in Greater Vancouver including the RCMP and BC Ambulance Service. For more information on Langley City’s transition to the E-Comm wide area radio system, contact Fire Chief Rory Thompson at 604.514.2880.